Several hundred rallied outside the Federal Building, Jan. 20, 2012. Photo by Lowell Waxman. 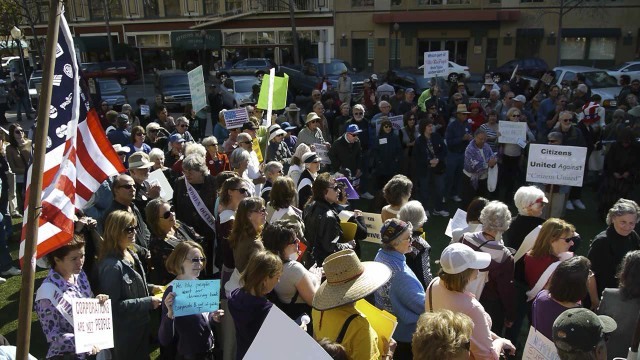 At least 250 San Diegans rallied on Friday, January 20th, in downtown San Diego against the US Supreme Court case known as “Citizens United”. It was the one year anniversary of the court decision that gutted campaign finance reform and that has eroded citizens’ rights of freedom of speech. 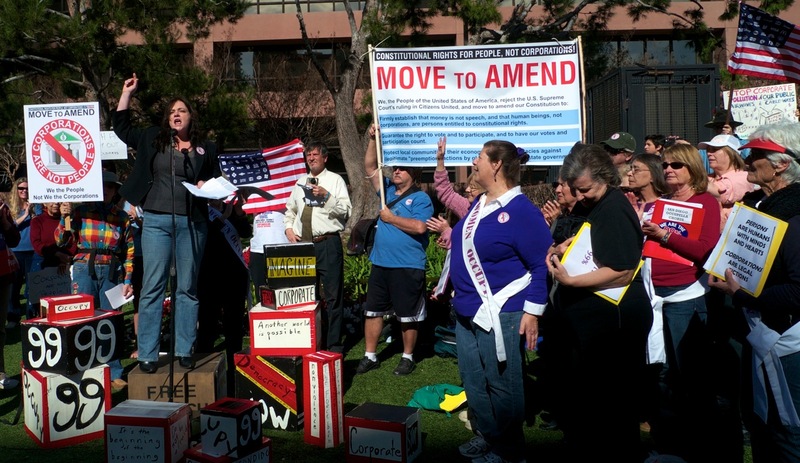 Organized by Women Occupy San Diego and Common Cause in conjunction with a national group called Move to Amend, the well-attended gathering next to the Federal Building was the largest protest in this city against the Supreme Court decision that has come to represent everything bad in modern American elections. The three women speakers all strove to have the protest focus on the worst in presidential and electoral politics. Keynote speaker Marjorie Cohn, law school professor and long-time activist, gave the background to Citizens United and decried how corporations are not citizens as “they don’t pass the belly button test”. She set the intellectual stage of why we oppose this horrific Supreme Court ruling allowing unfettered corporate monies to corrupt and overwhelm the fragile democratic process. Tahra Ludwig then gave a very impassioned speech, drawing close parallels between San Diego’s hundred-year-old Free Speech Fight by the Wobblies in downtown San Diego with the harassment that the Occupy San Diego movement has experienced from San Diego police. Ludwig has been an activist with Occupy San Diego, lives in Point Loma, and is in the process of joining the OB Rag. Tahra Ludwig raises her impassioned voice. Photo - Lowell Waxman. Rounding out the trio, Lori Saldana addressed the crowd, as she is running for Congress in the 52nd Congressional District, as a former state Assemblywoman. Saldana has been a supporter of progressive issues locally and has identified herself as a Occupy Wall Street enthusiast. 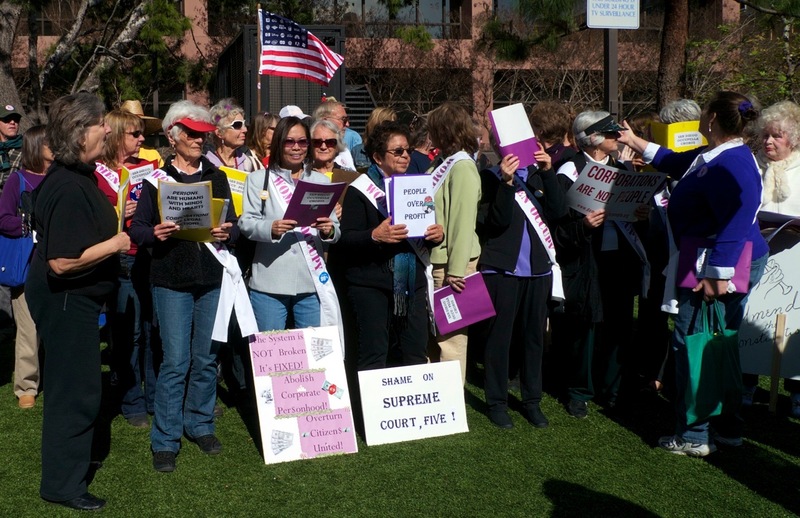 The crowd was blessed with the singing by the group Occupellas – a group of women vocalists supportive of Occupy San Diego, who have rewritten several old songs with new lyrics more in tune with current issues. The Occupellas sing to the crowd. Photo - Lowell Waxman. For a mid-day rally during the week, the turn-out at this protest was very good. Kudos to the women who organized this event. We do need to keep the pressure on against Citizens United – and until it is overturned or replaced – corporate and Super-Pac money in US politics will continue to exercise the loudest voice and drown out those of the citizens. And true to form, very little corporate press was on hand to record the protest. In fact, it appears that the “new” U-T San Diego totally ignored the rally. I wanted to keep this comment up as an example of what we receive sometimes in our mail. Wow – the mainstream newssites sure give a totally different purpose for the Occupy rallies from yesterday. One of our admins took the comment down. I think Liz was replying to a comment that was removed. The funding comes from the top. In a plutocracy or oligarchy, funding is given only to the rich. An elected official who tries to represent the people will simply have their funding cut by the state and federal government. 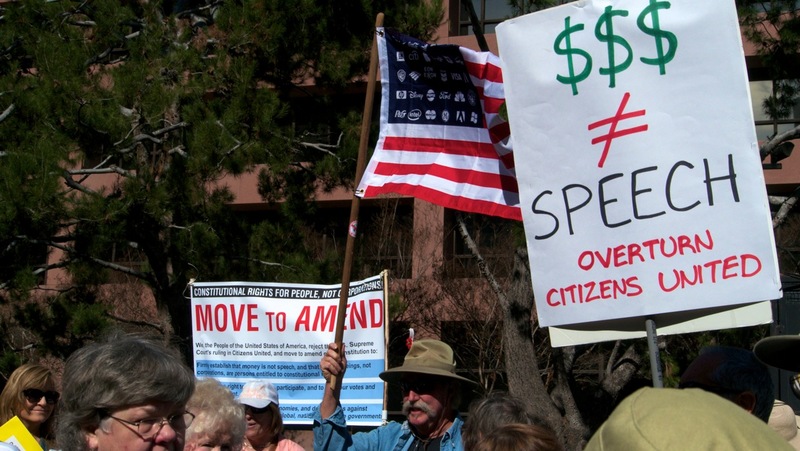 The Democrats who have co-opted Occupy San Diego are just like those good patriotic flag-waving voters who ran the anarchists Emma Goldman and Alexander Berkman out of town a hundred years ago. Comparing themselves to the Free Speech Movement is a total distortion of the truth. These people aren’t Occupiers working in the spirit of direct democracy, they’re capitalist imperialists voting for their own selfish interests and against the global struggle for social and economic justice. As the Wobblies, who were also run out of San Diego said, “Don’t vote–it only encourages ’em.” Registering voters and making demands on the oligarchy that wants only to murder millions more innocents around the world is not direct democracy–it is supporting fascism and injustice. so to recap what you’re saying: unless people commit to confrontation with the state they are not part of the solution, in fact they are “supporting fascism and injustice”. how infantile. you’re doing exactly what the State’s security apparatus wants. Doug, your “recap” is inaaccurate and puts words in my mouth that I never said. I didn’t say that people have to commit to confrontation with the state–that’s the position of the Democratic Party protesters in Occupy. All I’m saying is that doing your civic duty to the state by voting to delegate your power to the state constitutes support for the state and consent to be governed by the state. If anyone is infantile, it would be the protesters who vote to authorize the state to bash their heads in, and then complain when the state exercises that authority. We do not have a real democracy in our country. In the current system, elections and political power are for sale to those who have the money and media access to purchase and advertise the candidates they want to see in power. The occasional weak efforts to control money in politics have clearly failed and the media has become even more concentrated and influential. The poster child illustrating this power is “establishment outsider” Howard Dean, the once popular Democratic presidential candidate who was crushed by adverse media coverage, especially by CFR-connected media corporations. Furthermore, the winner-take-all election system without runoffs means that “spoiling” and “lesser evil” voting are built into the structure of the system. The winner-take-all election system disenfranchises large sections of the electorate, when, for example, a party, group, or person supported by 49 percent of the voters in a district gets zero representation. The Bush administration’s preemptive war doctrine, its disdain for allies, treaties, and international organizations, its refusal to consider or respect the interests of others, its attempts to shred constitutional rights and to justify torture and other illegal and immoral activity all occurred with considerable help from the Democratic Party. These policies have increased anti-Americanism in the Middle East and worldwide. This will translate into significant support for terrorism against the U.S. and its interests even if Kerry is elected and his Administration applies a different set of tactics. The ongoing question facing the vast majority of people in the United States is how to build a social movement that can effectively put democracy and a peaceful foreign policy on the national agenda. Only then can some of our other key needs be addressed. Something more basic than a mere switch in the means of empire is needed at this juncture in human history, something more fundamental than an imperial agenda dressed in the classic Democratic Party garb of multilateralism, something better than merely fastening a progressive tail to Kerry’s Democratic kite. What I want to ask you is can you qualify your position with a practical plan? Most Americans already see OWS as near anarchy. Of course they aren’t but it shows the unwillingness of the majority to support such destructive methods. The thing I’d point out to you is the same I’d say to OWS: Simply tearing it all down is no solution and you won’t get a lot of support, you shouldn’t. Offer a much better alternative and you won’t have to foment the seeds of destruction to tear down, that will happen on its own. I’m not fomenting seeds of destruction or advocating that anyone tear down anything, John. I’m simply saying that those who agree with the goals of that hypothetical mass social movement described in the essay you cite, should stop supporting the capitalist imperialist system. Here ya go, Doug. This is the government people are voting for, and it doesn’t matter who is President or which party is in power. This is from noted peace activist S. Brian Willson’s blog. S. Brian Willson – We are not worth more, they are not worth less. Mark, have you noticed how voting is becoming more and more “illegal”? If voting did not matter, why have the Republinuts been making moves to remove people from the voting rolls, making machines that manipulate the tallies, forcing voters to have ID, and all the other ways they’ve been discouraging Americans from actually casting ballots? Simple facts undermine your argument. It’s way, way more complex than your simpleton attempt to conjure up classical marxist theory. I’m not a Marxist, Frank, I’m an anarchist. I am opposed to centralized government of any type and opposed to oligarchies of any stripe. The chump change of a few million dollars that the Republicans spend on voter suppression to try to make people think that their votes are valuable, votes which the Supreme Court ruled in 2000 don’t even have to be counted, is a drop in the bucket compared to the billions they spend getting out the vote. Having spent almost a decade in the election integrity movement, I’m fully aware of the hundreds of problems, most of which would require Constitutional amendments to fix, plaguing our electoral system. Anyone who thinks that a vote which doesn’t have to be counted, can’t be verified, and serves only to delegate power to officials who can’t be held accountable, is valuable just because somebody is trying to take it away from them, doesn’t know the difference between an uncounted vote and a real voice in government. Nobody fought and died for uncounted votes–the struggle for the franchise was in hopes of having a real voice in government. The U-T finally mentioned the rally in an oblique way in today’s Sunday edition, by noting that candidate Lori Saldana had spoken at a rally organized by the “occupy movement”. WOW– And just why may I ask? Older Article: Internet Dating: From Cougar to Cub to “Boy Toy” or What’s It All About?